Top Bar Hive (TBH) beekeeping is a fascinating and satisfying hobby. It is a more natural, bee-friendly method of keeping bees than the modern Langstroth hive. There are advantages and disadvantages to both methods, but one of the main challenges to managing TBHs is that the comb is frameless. Frameless comb allows the bees to build their comb more like they do in nature. On their own, bees build their comb in a catenary curve - the curve a chain assumes when it is held equally at both ends. The St. Louis Arch is an example of a catenary curve that is displayed upside down. In a TBH, bees begin building their comb hanging from the bars. As the comb is completed, the bees will fill it out to the very edges of the hive body, following the contour of the box as you can see at the right. 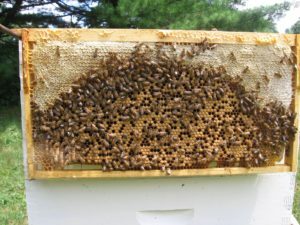 When the comb is heavy with honey stores or brood, they will attach one or more small sections at the edge of their comb to the side of the box. This is called "brace comb". Brace comb is a type of gusset. Gussets are a common way to strengthen a mechanical connection in steel or wood construction. It is great engineering on the part of the bees. In order to do hive inspection and maintenance, the TBH beekeeper will need to move and lift one or more of the frames that are loaded with bees, stores, and brood. Every spot of brace comb must be carefully cut away from the body of the hive before moving the frame so that this removal is not destructive. Attempting to move and lift the bars without severing the brace comb will result in unpredictable breakage, and perhaps even collapse of the whole comb. After inspection and maintenance, the bees will quickly repair and replace any brace comb they feel is necessary to support the comb. In a Langstroth hive, each frame of comb is supported on all four sides. These frames are easier to move and lift during inspection and maintenance. The comb is attached to the frame, but the sides of the frame do not touch the inside of the box. Hence, no brace comb for the beekeeper to deal with. It is not as natural a life for the bees, but it is easier for the beekeeper.Every TBH keeper will experience the breakage of a comb at some point. Comb may break during removal or handling. Heat is a factor; comb is more likely to break during the summer than the spring or fall. New comb is off white in color. It is quite soft at this stage. Older comb can be quite dark in color. It is lined with old cocoons and has been stained by propolis and pollen from the thousands of bee feet as they work the hive. Older comb is stronger than new comb, but it can still be quite delicate in hot weather or if it is handled incorrectly. Occasionally comb will need to be removed from a bar due to cross-combing. Cross-combing is when a section of comb crosses from one bar to another, making the bar difficult, if not impossible, to lift. Bees could care less about our ability to move comb to manage a hive. They may cross-comb a bar to some degree from a small area of attachment on one edge to building comb 90° to the bar. If comb has been cross-combed, it must be straightened and centered. If the cross-combing is severe enough, the entire comb may need to be cut away and reattached. We have used both frameless and framed comb. We wanted to observe the differences first hand. While we recognize that each has merits, frameless is without a doubt better for the bees. It is natural to their instincts and evolution. We searched for ways to repair comb, and found several - hair clips, tying them in with string, wire, or dental floss. They worked, but they were clumsy, time consuming, and did some damage along the way. We eventually saw the seed of an idea on the web, and then tweaked it until it worked well for us. It is fast, efficient, and does very little damage to comb or brood. If you are a frameless comb beekeeper, you will definitely want to see it at this link. If you are a Langstroth beekeeper, but are interested in going frameless, it can certainly be done. Remove the bottom bar of each brood frame and replace them in a double medium brood nest (two medium supers stacked as one brood chamber). It does not make much sense for a Langstroth beekeeper to use frameless honey bars, so your honey supers can remain framed.